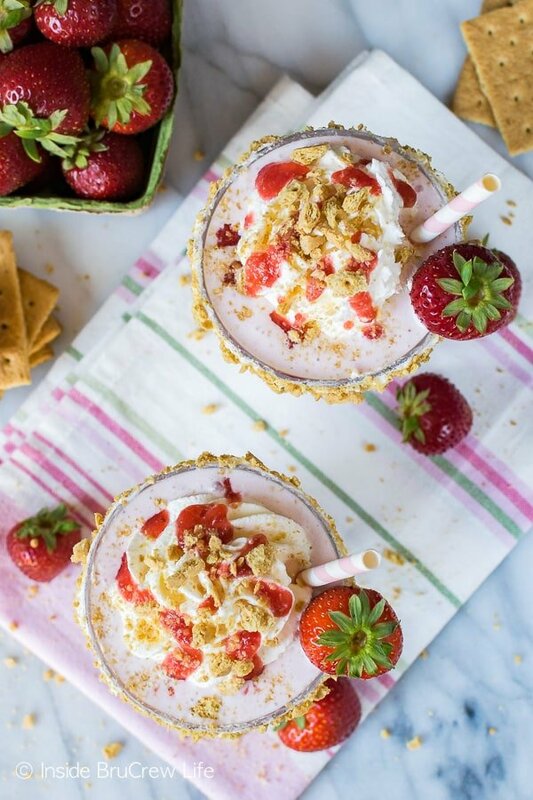 Swirls of strawberries and graham cracker crumbs give these Strawberry Cheesecake Milkshakes a fun flair. These frozen drinks are a great way to cool off on a hot day. This post was brought to you by the makers of Promised Land Dairy for the #FarFromOrdinaryMilk campaign. I received compensation to write this post through the Far From Ordinary Milk program. All opinions expressed are my own. The past few weeks we have been enjoying the lazy days of summer in our new home. We splashed in the pool and bobbed in the waves at the beach trying to cool off. We also walked around the outlet malls looking for new school clothes as summer came to a close. One thing that we had to get used to was the climate change. We were used to the dry heat of Texas, but not the humidity and daily rain of Florida. Thank goodness for an icemaker in the fridge and lots of ice cream in the freezer because fun chilly drinks will need to happen often. 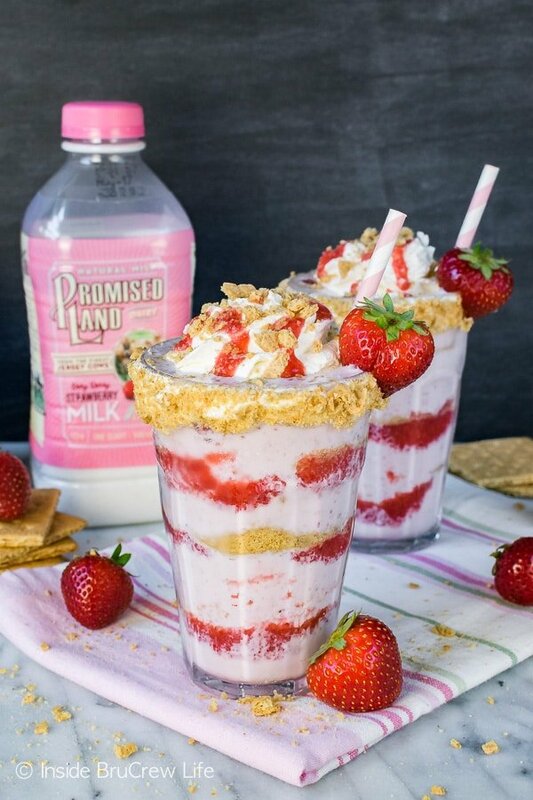 This summer and fall I have the awesome opportunity to work with Promised Land Dairy sharing recipes I created with their milk. Of course, the first thing I did when I got my shipment of Very Berry Strawberry Milk was to pour a big glass. I have to admit I was a big fan after my first sip. 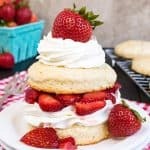 The milk is creamy with a sweet strawberry flavor. It reminded me of when I would make ice cream “soup” as a child. Please tell me I wasn’t the only one who would stir ice cream until it melted. Ok, so maybe I was the only strange one who did that. Promised Land Dairy provides wholesome milk from unique Jersey cows. This premium milk is free of artificial flavors, colors, and hormones, and it is high in protein and calcium. 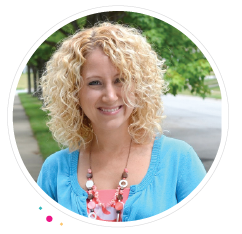 As a mom of three growing teenagers, I am always looking for products made from quality ingredients. After a few hours of beach fun this past weekend, we came home hot and sweaty and ready to cool off with a fun drink. I had picked up fresh strawberries, strawberry ice cream, and cream cheese to blend with the strawberry milk. 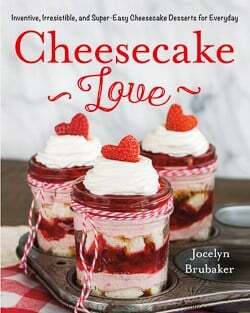 I am always looking for fun ways to incorporate cheesecake into everything we make. 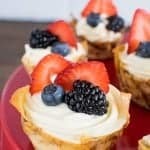 These strawberry cheesecake cupcakes are always a favorite treat, so I knew that flavor would be perfect for a milkshake. 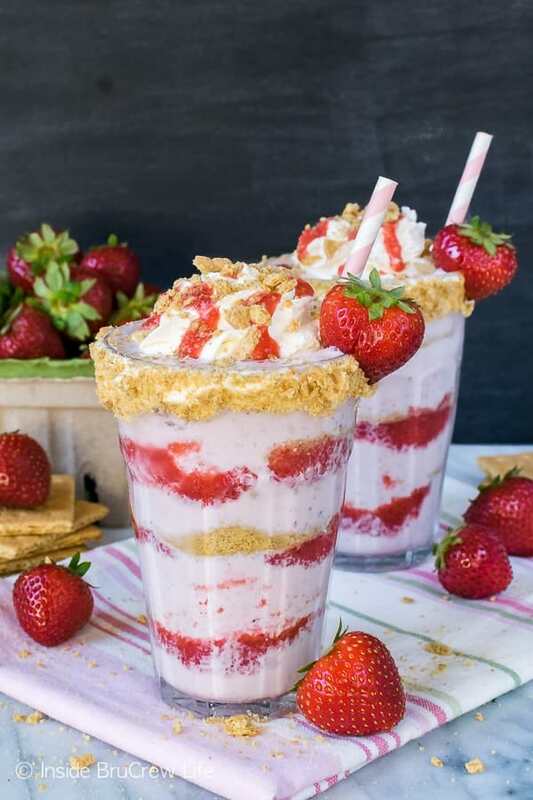 To jazz the drinks up, I layered the strawberry cheesecake milkshakes with pureed strawberries and graham cracker crumbs. Adding a fun striped straw and a fresh strawberry on the side made each drink look like it came from an old-fashioned ice cream parlor. Get ready to enjoy the last few days of summer by mixing up some ice cream and milk into a frozen creamy drink full of cheesecake goodness. You can thank me later! 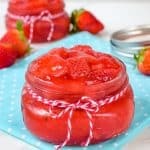 Puree ¾ cup strawberries with the sugar. Remove 1 Tablespoon to a separate bowl. Set both aside. Use a knife to spread Cool Whip around the rims of 2 cups. 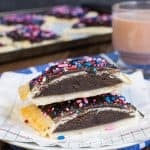 Sprinkle with graham cracker crumbs and pieces. Set upside down on a plate. 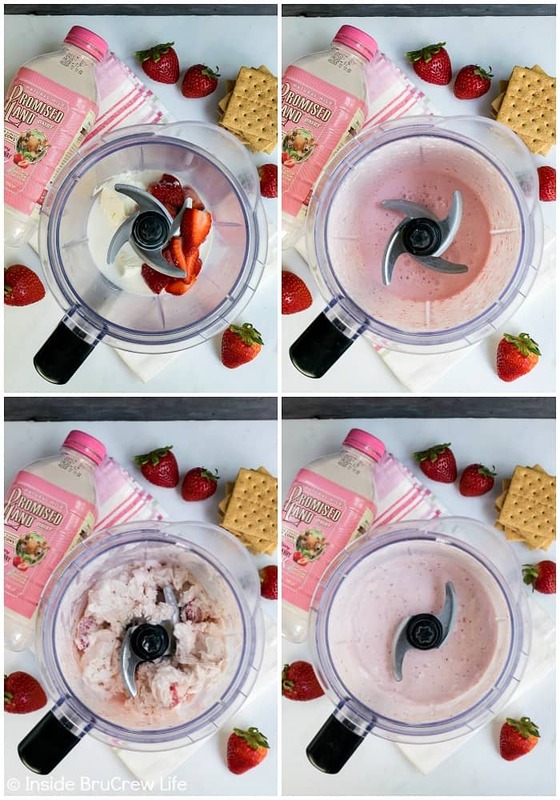 Place the rest of the sliced strawberries, cream cheese, vanilla, and milk in a blender and pulse until smooth. 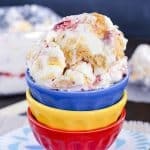 Add the ice cream and blend again. 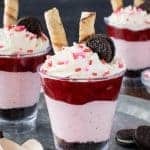 Layer the milkshake, strawberry puree, and graham cracker crumbs in the prepared glasses. 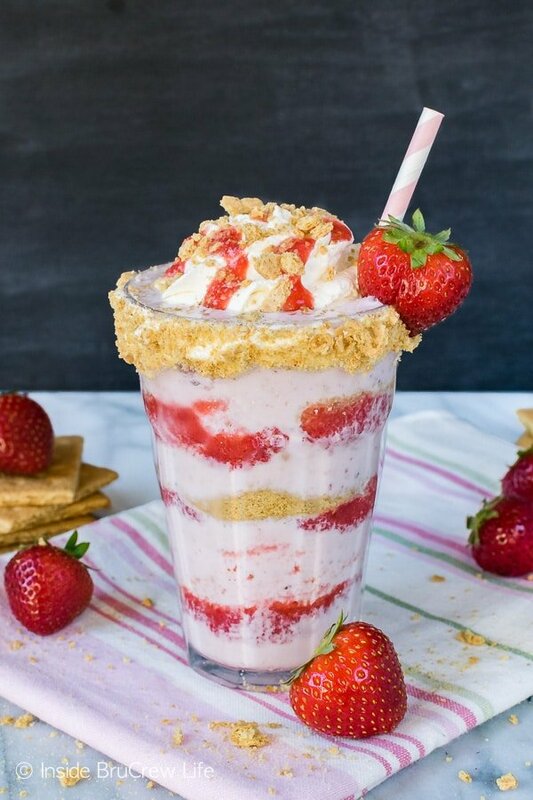 Top with Cool Whip, reserved strawberry puree, and graham cracker pieces. Serve immediately.